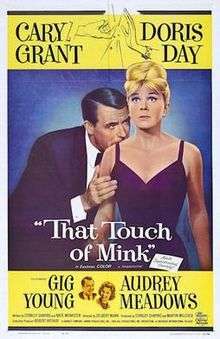 That Touch of Mink is a 1962 American Eastmancolor romantic comedy film directed by Delbert Mann starring Cary Grant, Doris Day, Gig Young and Audrey Meadows. Cathy Timberlake, a New York City career woman, meets Philip Shayne. His Rolls Royce splashes her dress with mud while she is on her way to a job interview. Philip wants an affair, while Cathy is holding out for marriage. Watching from the sidelines are Philip's financial manager, Roger, who sees a therapist because he feels guilty about helping his boss with his numerous conquests, and Cathy's roommate, Connie Emerson, who knows what Philip is after. Philip wines and dines Cathy. He takes her to see the New York Yankees play. They watch from the Yankees dugout (he owns part of the team). Cathy's complaints about the umpire while seated alongside Mickey Mantle, Roger Maris and Yogi Berra (playing themselves), cause Art Passarella to throw all of them out of the game. Philip's conscience weighs on him, so he withdraws an invitation to Bermuda, which only serves to make Cathy agree to go. While in Bermuda, Cathy comes down with a nervous rash, much to her embarrassment and his frustration. The Bermuda trip is repeated, but this time Cathy drinks to soothe her nerves and ends up drunk. While intoxicated, Cathy falls off the balcony onto an awning below. She is then carried in her pajamas through the crowded hotel lobby. At the urging of Roger and Connie who are convinced that Philip is in love with her, Cathy goes on a date with Beasley, whom she dislikes, to make Philip jealous. Her plan succeeds and she and Philip get married. On their honeymoon, he breaks out in a rash. In May 1962, Fawcett's line of Gold Medal Books issued a paperback novelization by-lined John Tessitore. It is unknown if this is the author's actual name or a pseudonym; novelization work tended to go to seasoned authors, and during that era, the "Tessitore" by-line only ever appeared on three Gold Medal film tie-ins. In any event, the novel is written in the first person, from the POV of Doris Day's character Cathy Timberlake. The film grossed $17,648,927 at the box office, earning $8.5 million in US theatrical rentals. It was the 4th highest grossing film of 1962. Rotten Tomatoes gives the film a critic score of 78% and an audience score of 70%. Nominated for three Academy Awards: Best Art Direction (Alexander Golitzen, Robert Clatworthy, George Milo), Best Sound (Waldon O. Watson) & Best Writing, Story and Screenplay — Written Directly for the Screen (Stanley Shapiro, Nate Monaster). Won the Golden Globe for Best Comedy Picture and Cary Grant was nominated for Best Motion Picture Actor — Musical/Comedy. Won the Golden Laurel for Top Comedy, while Doris Day won for Top Female Comedy Performance, Cary Grant for Top Male Comedy Performance and Gig Young for Top Male Supporting Performance. Won the Writers Guild of America Award for Best Written American Comedy. Cary Grant was a big fan of The Honeymooners and Audrey Meadows in particular, and was responsible for getting her the part of Connie. In her autobiography, Doris Day wrote that Cary Grant was very professional and exacting with details, helping her with her wardrobe choices for the film and decorating the library set with his own books from home. However, he was a completely private person, totally reserved, and very distant. Their relationship on this film was amicable but totally devoid of give-and-take. When Roger (Gig Young) is showing Cathy (Doris Day) the list of potential husbands for her, we learn that one of the names on the list is Rock Hudson, Day's co-star in Pillow Talk, Lover Come Back, and Send Me No Flowers. In fact, Rock Hudson had expected to be cast as Philip, but director Delbert Mann wanted Cary Grant. Grant hated the finished film. 1 2 Box Office Information for That Touch of Mink. The Numbers. Retrieved June 13, 2013. ↑ "All-time top film grossers", Variety. 8 January 1964 pg 37. ↑ "The 35th Academy Awards (1963) Nominees and Winners". Oscars. Retrieved 2011-08-23. ↑ "That Touch of Mink". The New York Times. Retrieved 2008-12-25. ↑ "AFI's 100 Years...100 Passions Nominees" (PDF). Retrieved 2016-08-20.